This page gives the basic Rummy rules. This version of the game is also known as Basic Rummy, Straight Rummy or Traditional Rummy. Rummy has been played in the US since the beginning of the 19th Century as a social card game. Its popularity has led to inclusion into the casino gaming sphere. Gin Rummy now features an annual Las Vegas international tournament. Rummy can be played by 2 to 6 players. Rummy uses the standard deck of 52 playing cards. The first dealer is selected randomly. To do this, shuffle and cut the deck. Then each player selects a card from the top of the deck. High card deals. After each round of play, the player to the dealer’s left will deal. In other words, the deal rotates clockwise. If two people are playing, deal 10 cards face down to each player. For three or four players, deal 7 cards each. For five or six players, deal 6 cards each. After each player has received their cards, the dealer turns over the top card of the deck and places it face-up on the table. This will be the discard pile. The remainder of the deck will be used as the stock pile. The object of each round of the game is to be the first player to get rid of all your cards. The player to the dealer’s left starts. Draw one card either from the discard pile (which is face-up) or the stock pile (which is face-down). Now you have the option to play a run or a set, or to add cards to a run or set that has already been played. 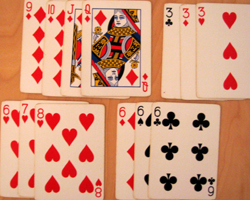 A run is three or more consecutive cards of the same suit. For example, 3 4 5 of hearts is a run. A set is three or four cards of the same rank. For example, 9 of hearts, 9 of clubs, 9 of spades is a set. You may play only one run or one set per turn. You do not have to play a run or set. This is optional. You may add a card or cards to existing runs or sets. For example, you may add the 6 of hearts to the run 3 4 5 of hearts. Then you may add the 9 of diamonds to the set of 9s. You may add as many cards as you wish. You do not have to add cards to existing runs or sets. This is also optional. Note: In this version of Rummy you are not allowed to rearrange existing runs or sets. Finally, to end your turn, discard one card from your hand. Place it face-up on the discard pile. You must discard one card. If you picked up a card from the discard pile to start your turn, you may not discard that same card this turn. You may, however, discard it in a later turn. If the stock pile runs out, turn over the discard pile to form the new stock pile. Do not shuffle it. After your turn, the player to your left goes next. Examples of runs and sets. The player who gets rid of all their cards first wins the round. The other players add up the score for all their remaining cards. The winner receives the points. The game continues until one player achieves a certain number of points, which was decided before the game began. Typically, Rummy is played to 100 points. Below are common game variations to the basic rules. – This rule allows players to play more than one run or set during their turn. – Aces may be used in high or low runs. For example, Q K A or A 2 3. – A player may discard any card to end their turn, including a card picked up from the discard pile. – To go out, the player must discard their final card. – When the stock pile is exhausted, the discard pile is shuffled before turning it face-down as the stock pile. – In this scoring variation, the winner of the round does not receive the points from all players. Instead each player is scored by the points remaining in their hand. When one player reaches 100 points, the player with the lowest score wins. – A player who gets rid of all their cards in one turn without having previously layed down any cards gets a Rummy and scores double.